← Wacky Wednesdays – Milk Deads! 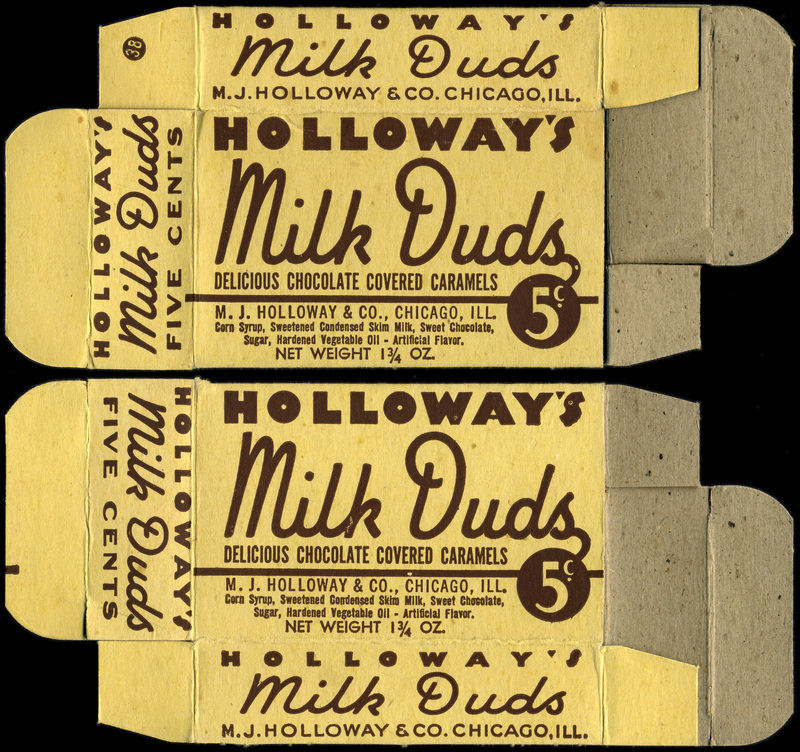 Milk Duds is a confectionery classic that was first sold in 1926 by the Holloway company of Chicago. It’s a pretty simple bit of candy as so many classics are; a chewy nugget of caramel surrounded by a tasty chocolatey coating. 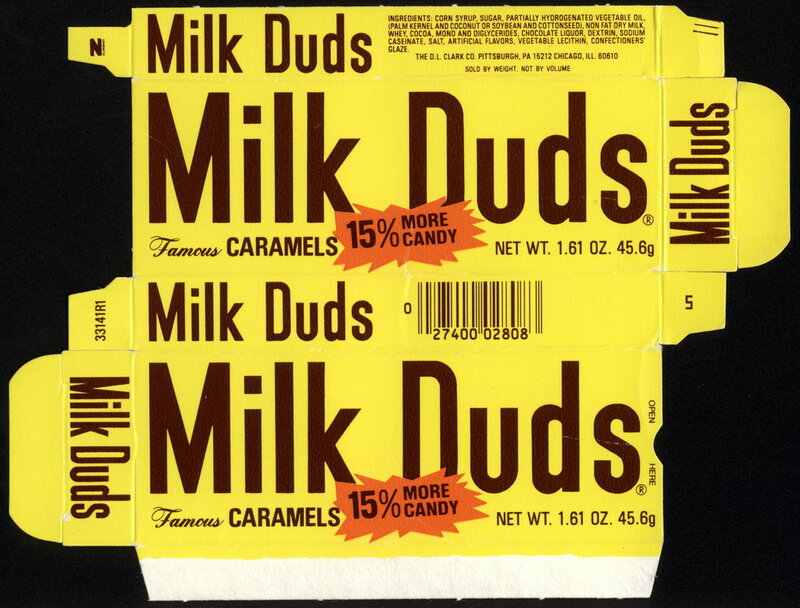 Along with Hot Tamales, Milk Duds have always been one of my favorite movie theater go-to candies. 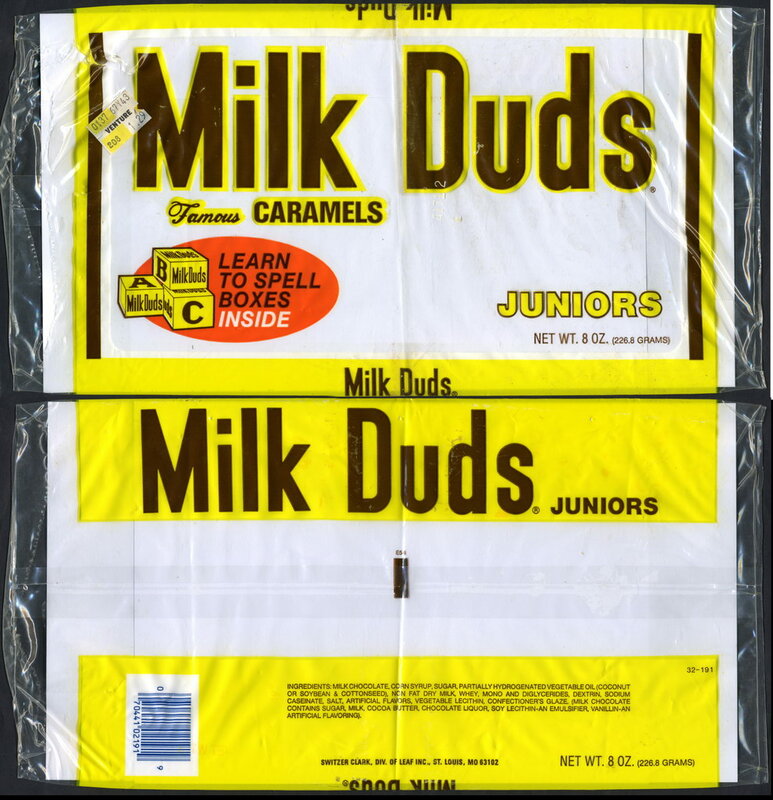 Over the years, I’ve picked up quite a variety of Milk Duds packages that dot their history, though most of what I have is from the last forty years. 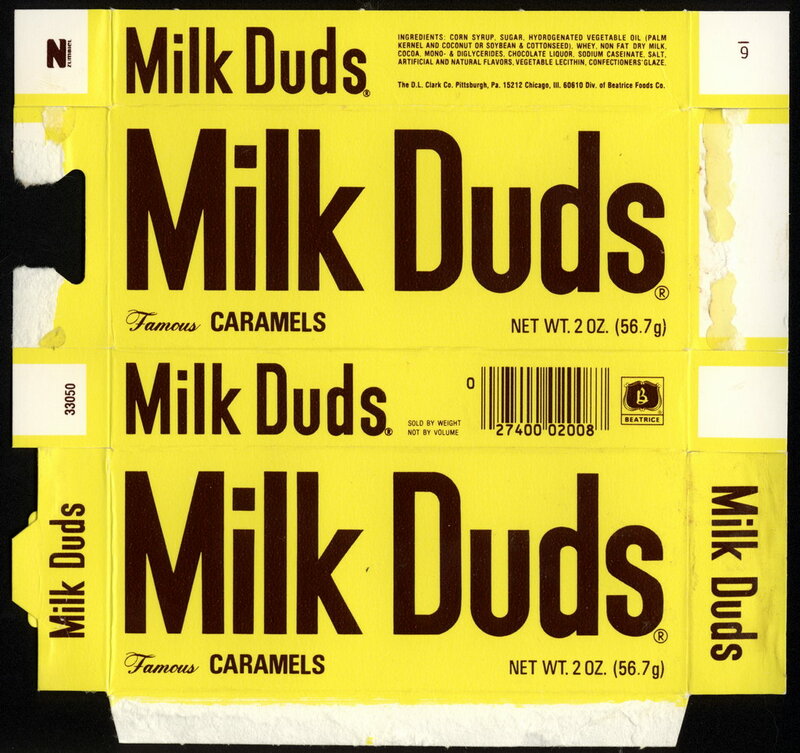 So today and tomorrow, I’m going to share what I have and walk you through the pieces of Milk Duds history that my collection can shine a light on. 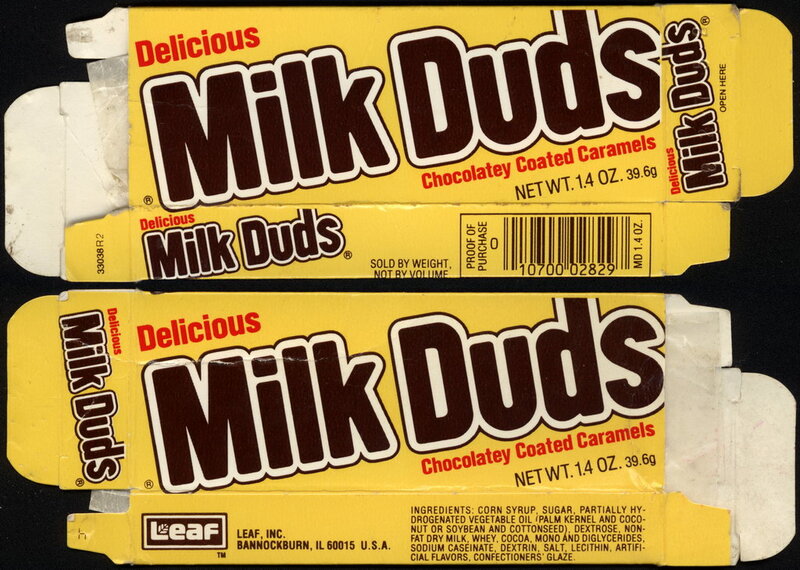 Today is what we’ll call the standard Milk Duds chapter and tomorrow it’s going to be the exotic Milk Duds brand extensions. 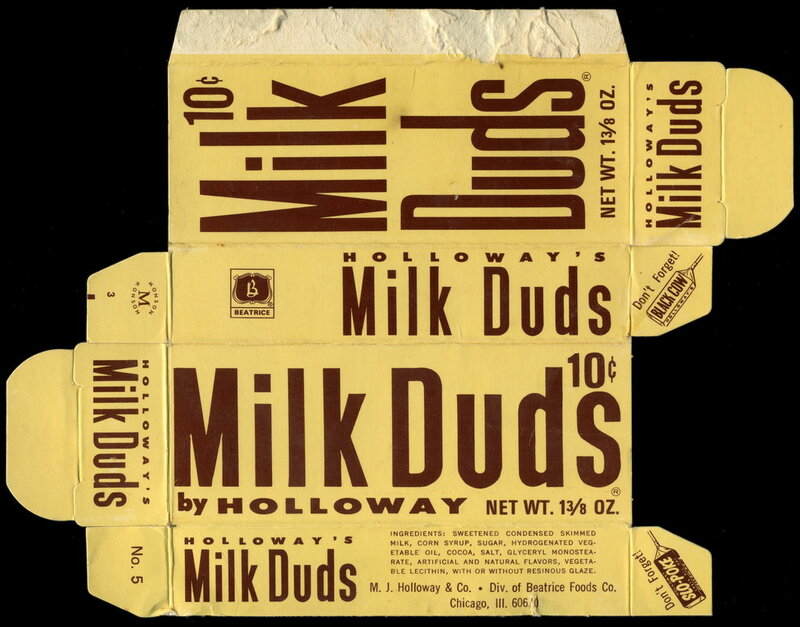 Unlike some brands that have seen dramatic changes in colorful packaging and mascots through the years, Milk Duds have been steady and reliable. 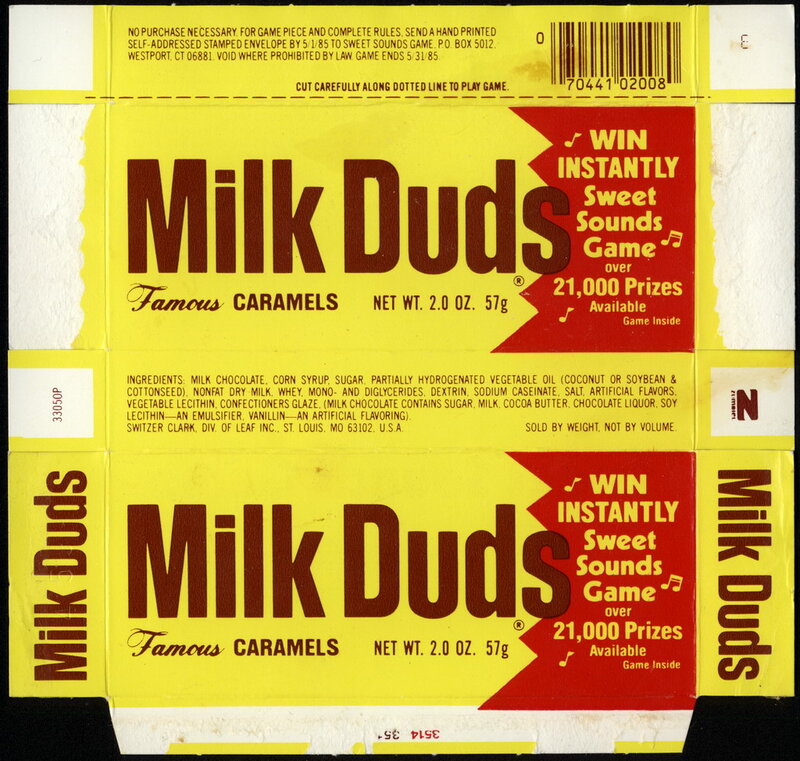 My earliest box is a yellow hue with brown logo, a look which is still largely the design the boxes retain to this day. 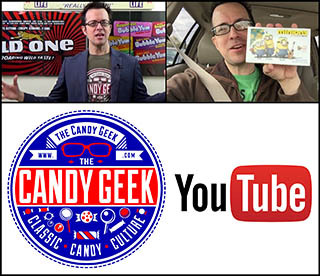 I’ll admit that it was this very consistency that, for a long time, kept me from giving much thought to the packaging or to putting much effort to collecting it. These days I find that I can celebrate its consistency and the small tweaks it has experienced in its long life. But consider this a warning: to the casual observer, you may find that many of the boxes I’m going to share with you today all start to look the same. You have my permission to skim a bit, but if you are curious and want to take a closer look, you’ll note the many subtle design evolutions and company changes along the way. The problem with this consistency in packaging style is that it often makes it difficult to precisely date a package. I’ve spent a lot of time to narrow in on ways to define each period and where each design fits along the way. I think I’ve created a pretty good roadmap for dating boxes of the 1970-2012 vintage. 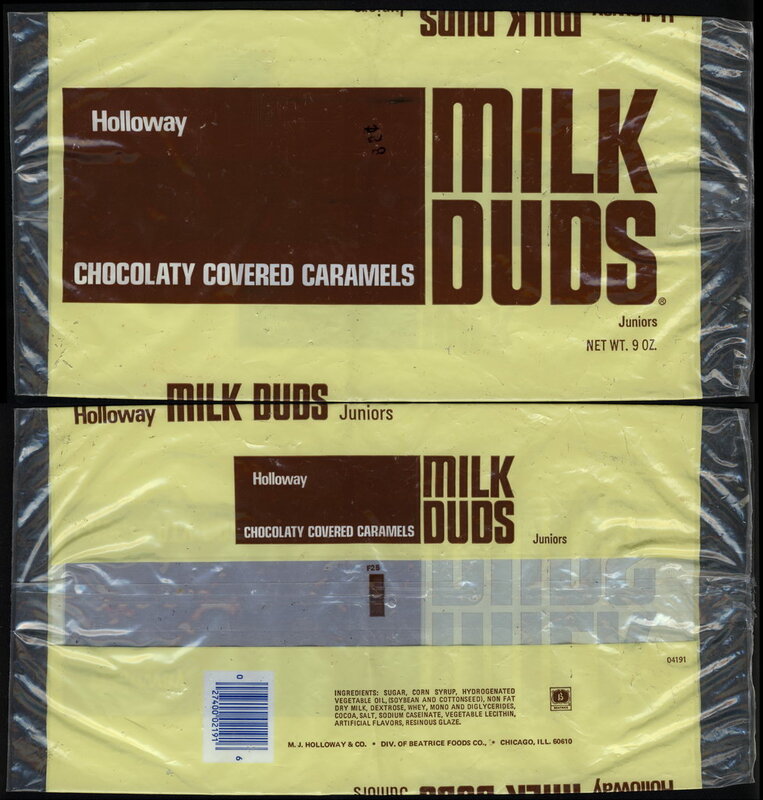 Following is a similar box that incorporates illustrations of the Milk Duds themselves. Still retaining much of the look of that earlier box, I determined that this one was later as it included a trademark next to the logo that the previous box lacked. It is at this point in the timeline of Milk Duds packaging that I must do a bit of hand-waving. What I know is, is that the Beatrice company purchased Holloway in 1960, though it continued to operate under its original name into the late 1970’s. I will speculate that the box design seen below might have been one initiated due to the ownership change, though that is merely speculation. The next image of a box I have in my files is from 1963, and by that time it was sporting a very different look than the early, scripted logo style box. 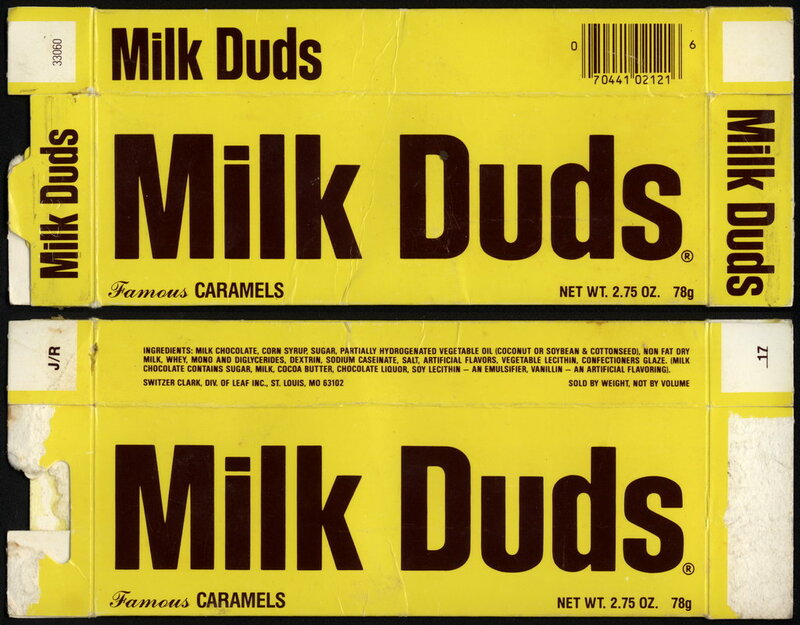 This more rigid logo is a design that Milk Duds would carry, off and on, for the next twenty years. 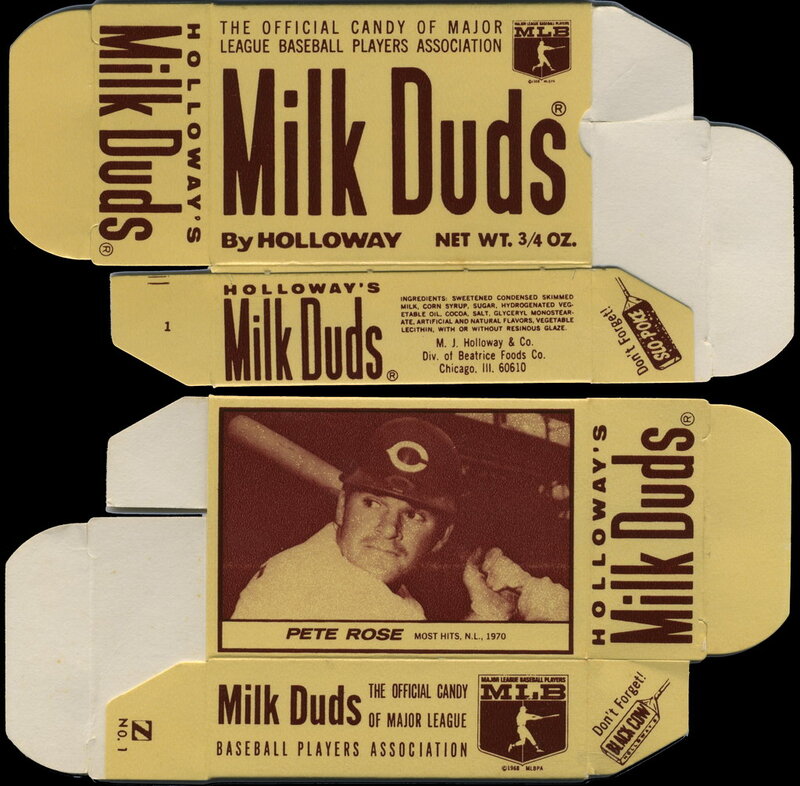 In 1971, Holloway did a baseball card promotion that is likely responsible for the survival of more vintage Milk Duds boxes for that year than all others combined. 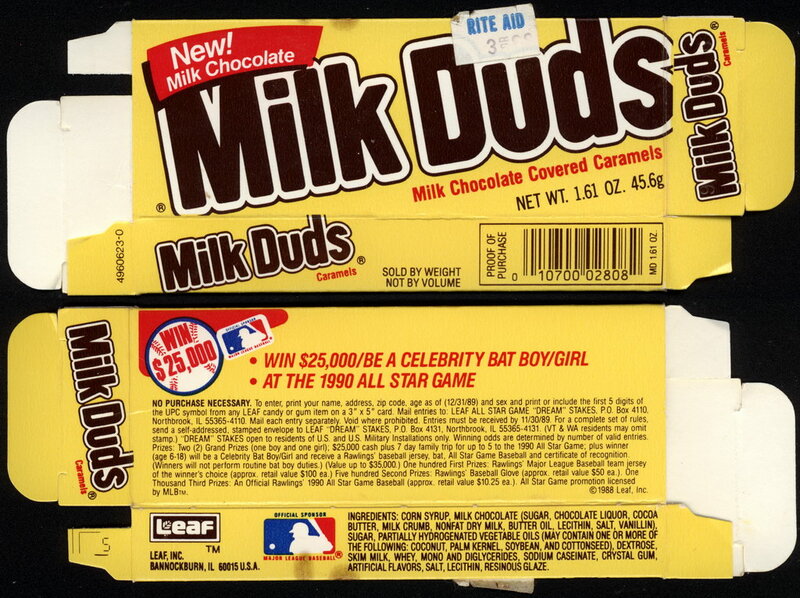 As a collector, you could consider this the first candy box I ever collected, though I was technically collecting Pete Rose cards when I picked it up. 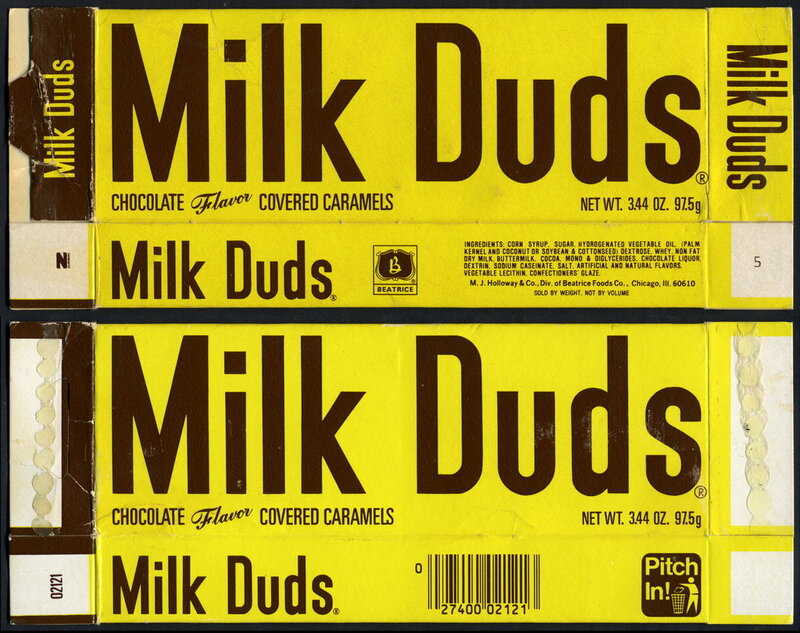 From here things were a little iffy when I first started because many late 70’s Milk Duds boxes look quite similar to the early 70’s boxes. I finally determined reliable groupings using whether or not boxes had UPC codes or not, among other things. 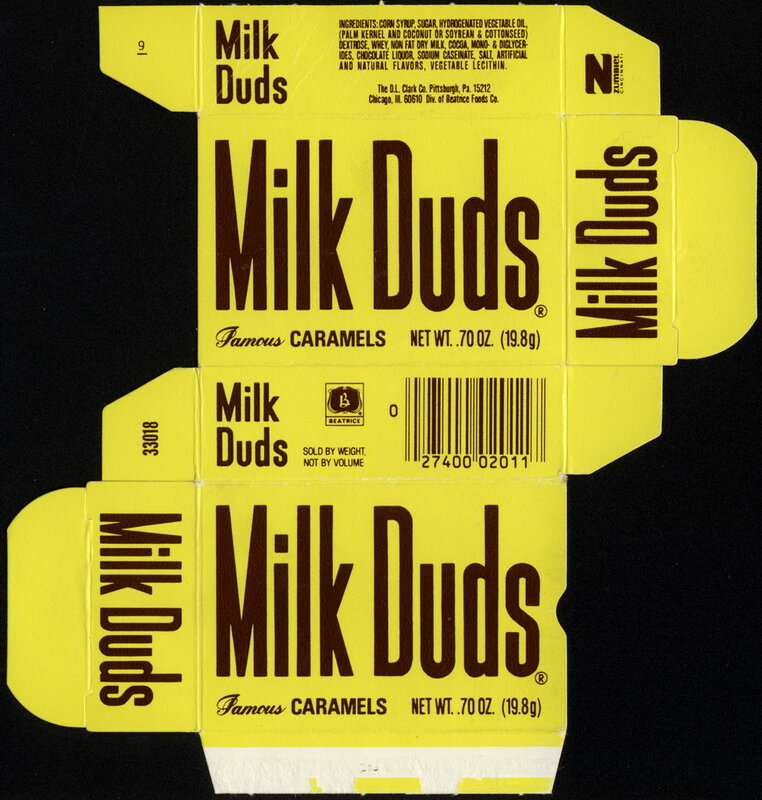 By 1974, Milk Duds would receive a significant packaging redesign. 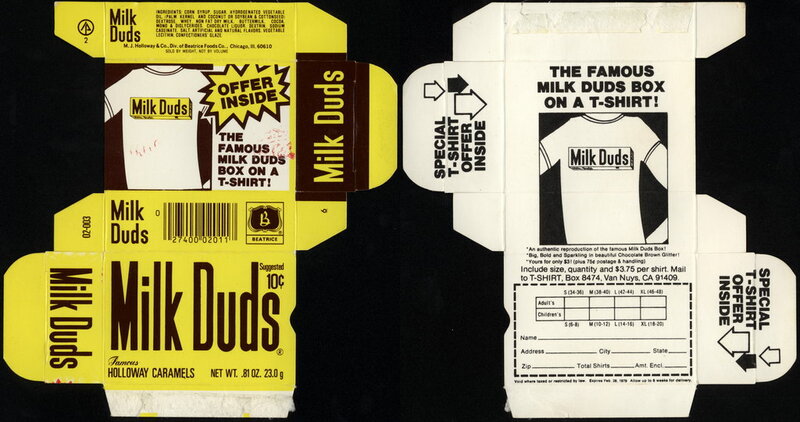 For a long time, this box design was difficult for me to track down, a quest which I discussed back in March for my Wacky Wednesdays Milk Muds post. 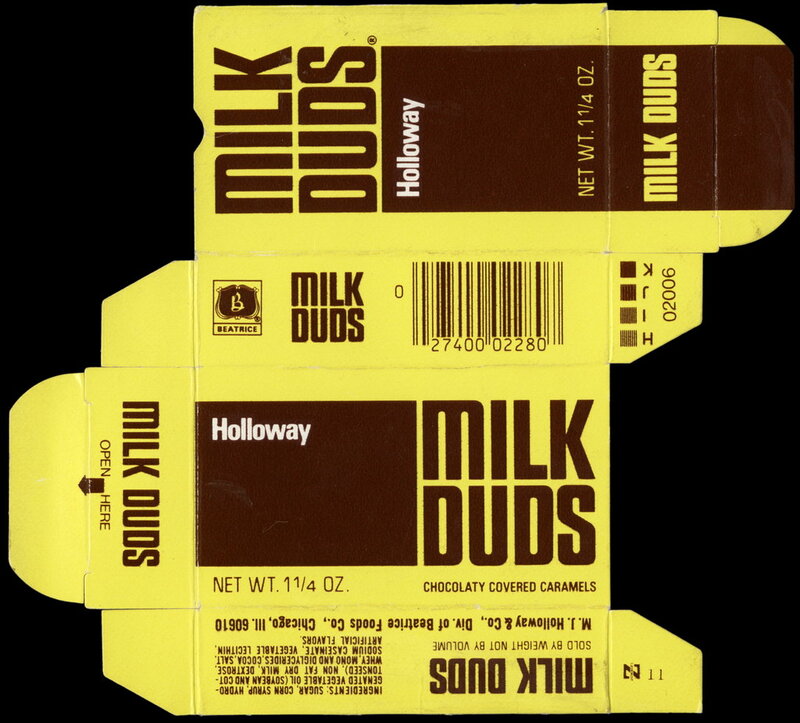 Here’s a Milk Duds 9oz Juniors package featuring this mid-70’s design. I’ve got one of those Juniors boxes, but I’m saving it for the end of today’s post. 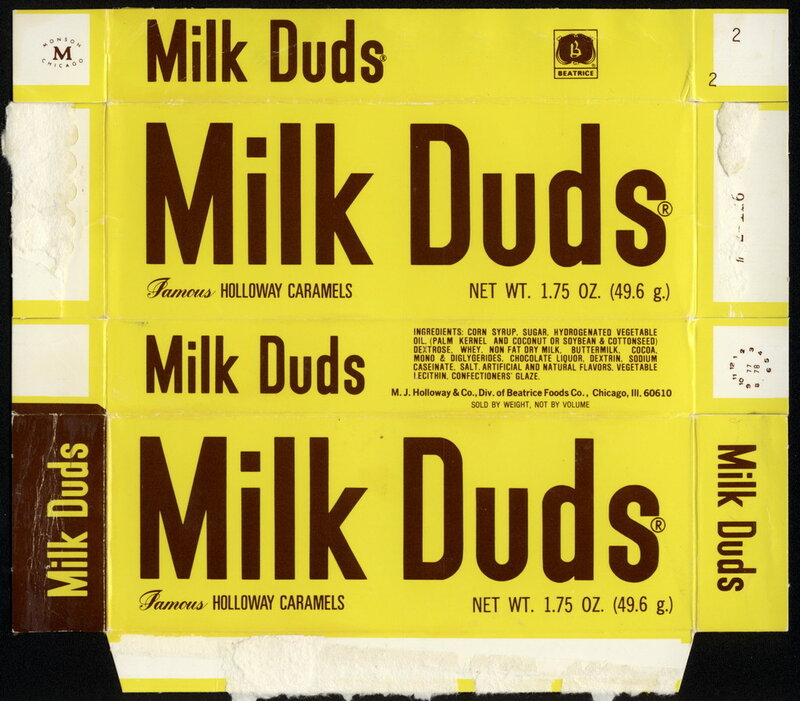 By 1977, the logo for Milk Duds would be revised back to the way it looked in 1972. I’m not sure why this change was made, only that it was. This next box from 1982 still features the D.L. Clark ownership, but now gone is any mention of Beatrice. 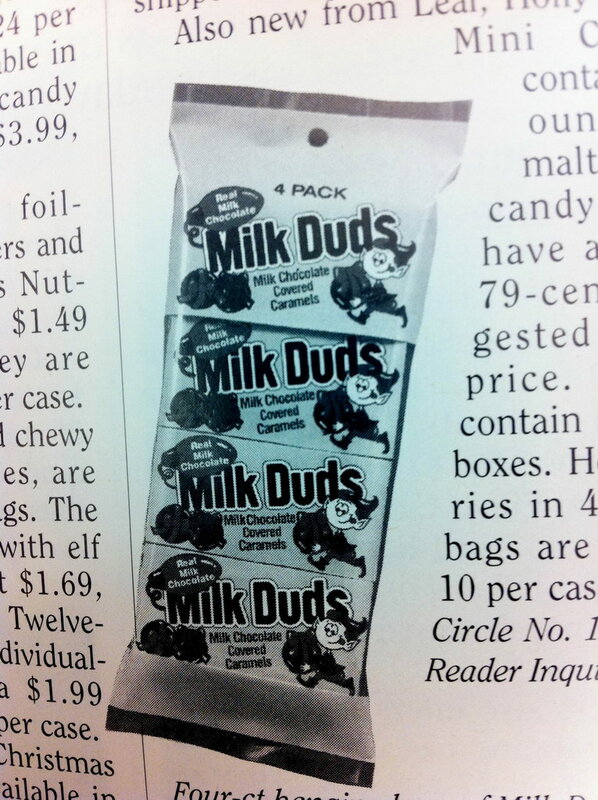 From this point until a few years later, Milk Duds boxes had Switzer-Clark, Division of Leaf branding. From here, it’s on to the late 80’s, when Switzer-Clark became simply, Leaf. 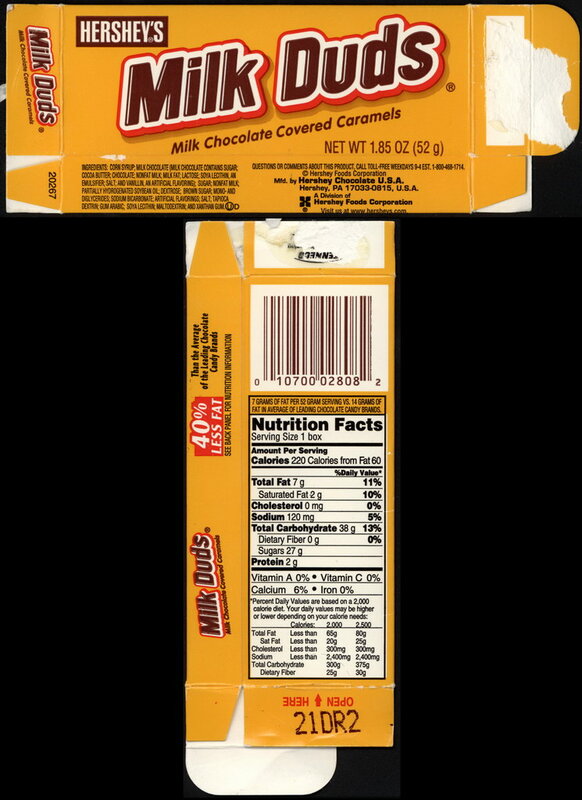 The most recent version of the standard box drops the Hershey logo from the front. Whew! 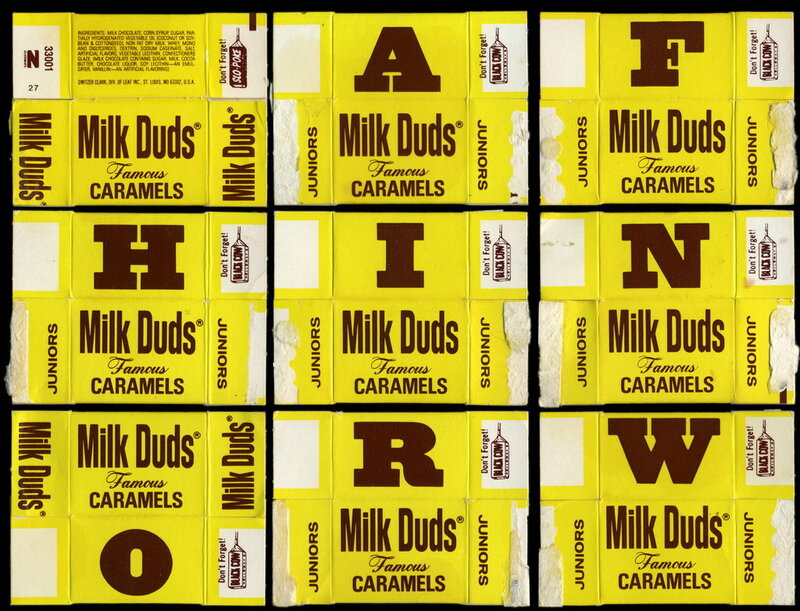 If you’re still following along, we’ve just tracked 35 different Milk Duds boxes over 80 years. I’m going to close with a pair of fun pieces. 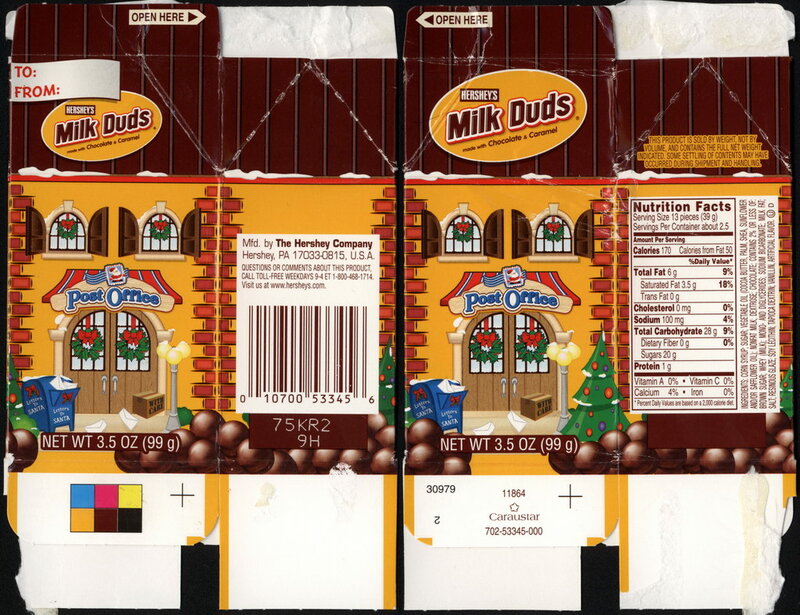 The first is a Milk Duds Christmas Holiday box, which is part of a larger series of boxes that have been on sale the last few years. They are made to look like elements of a tiny Christmas village. 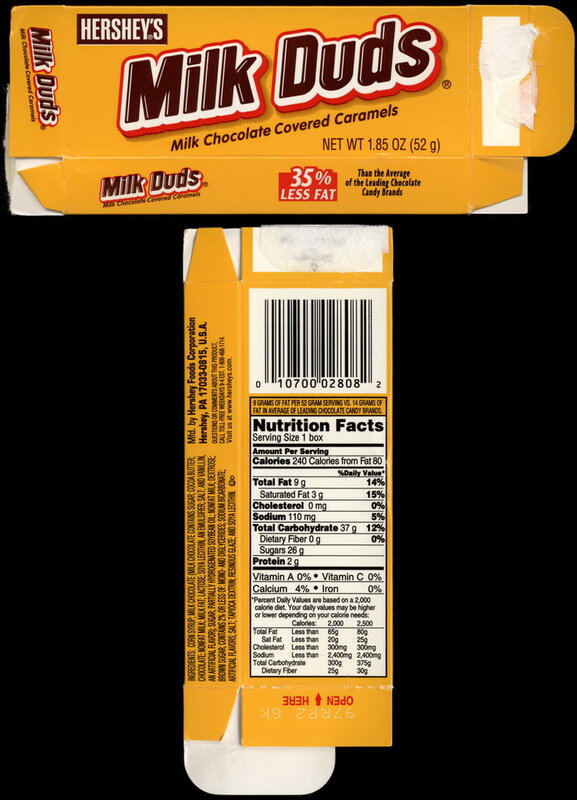 The Milk Duds is the post office. And that is everything for today’s post. I told you it was going to be a biggie! Tomorrow I’ll be back with a much shorter, much more exotic post. 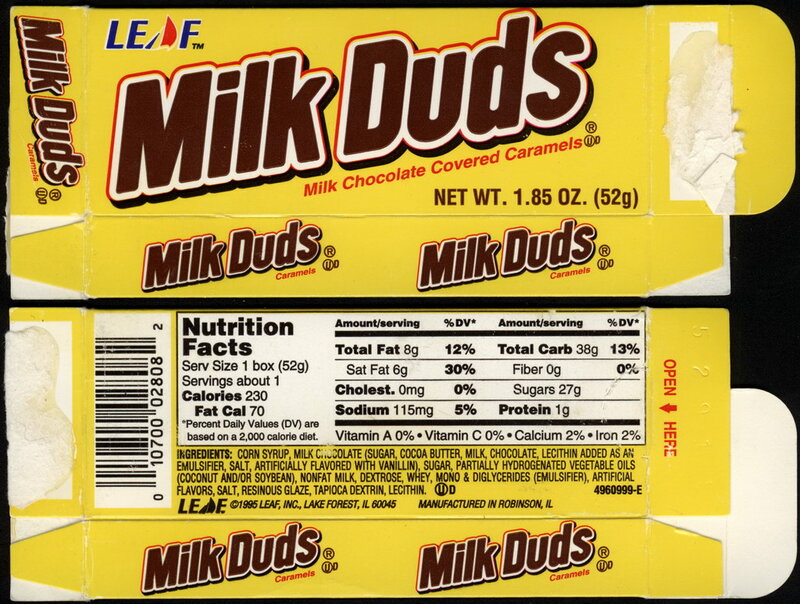 I’ll be wrapping up this topic by covering the flavorful brand extensions of Milk Duds I’ve collected, showcasing no less than three pieces of packaging which have never been seen anywhere on the internet before! You won’t want to miss it! This entry was posted in 1950's, 1960's, 1970's, 1980's, 1990's, Boxed, Chocolate, Hershey and tagged candy collecting, candy collection, candy collector, candy wrapper collection, candy wrapper collector, collectible, collecting candy, confectionery, confections, Hershey, Holloway, Milk Duds, packaging, sweets, vintage, vintage candy wrapper, wrapper. Bookmark the permalink. 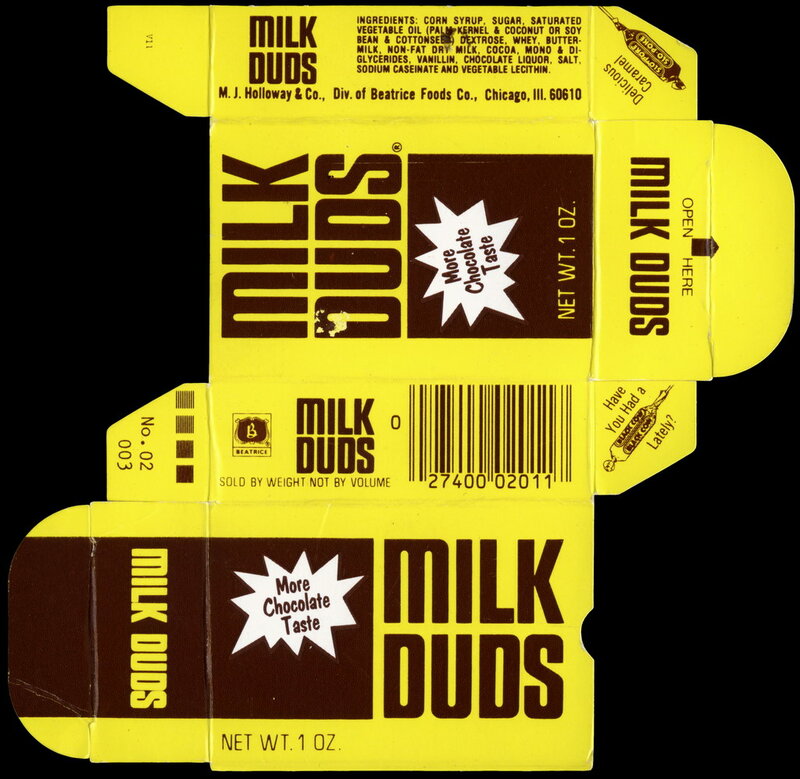 8 Responses to Milk Duds – 86 Years and 40 different packages! 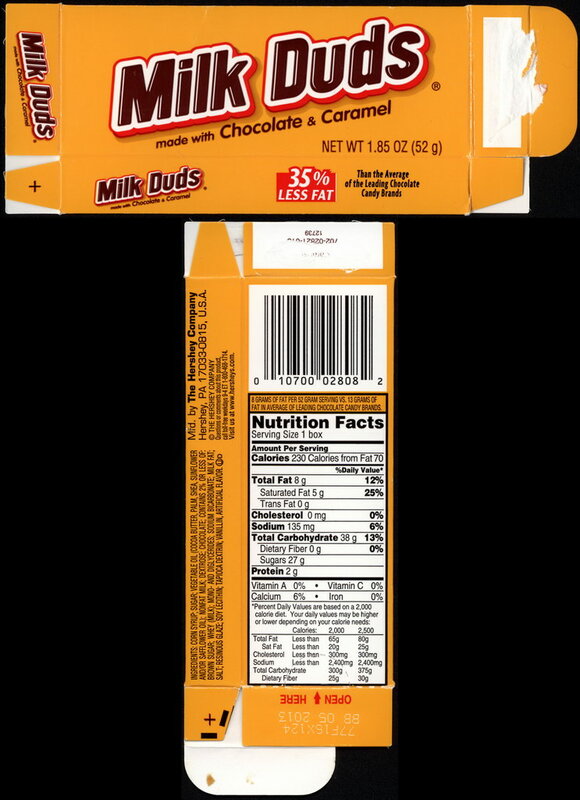 Fascinating to watch the cost-cutting changes while this product is manufactured on Hershey’s watch. 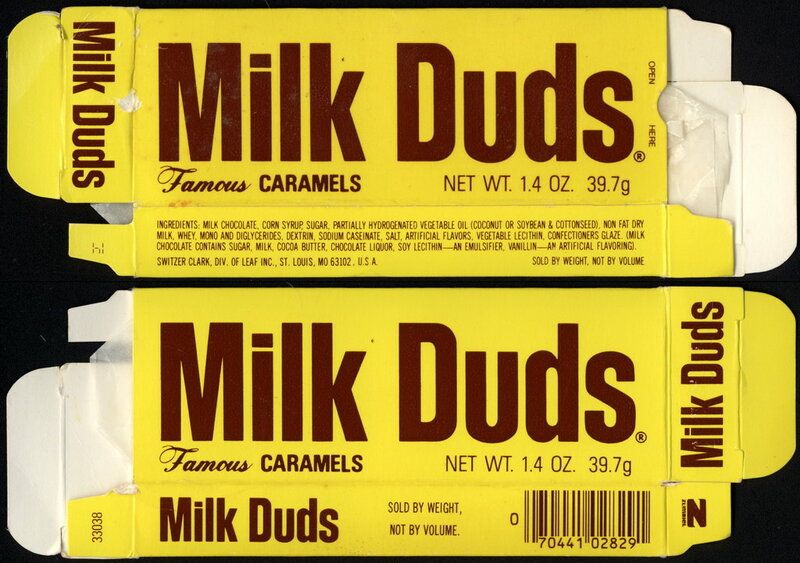 Specifically: eliminating real milk chocolate. 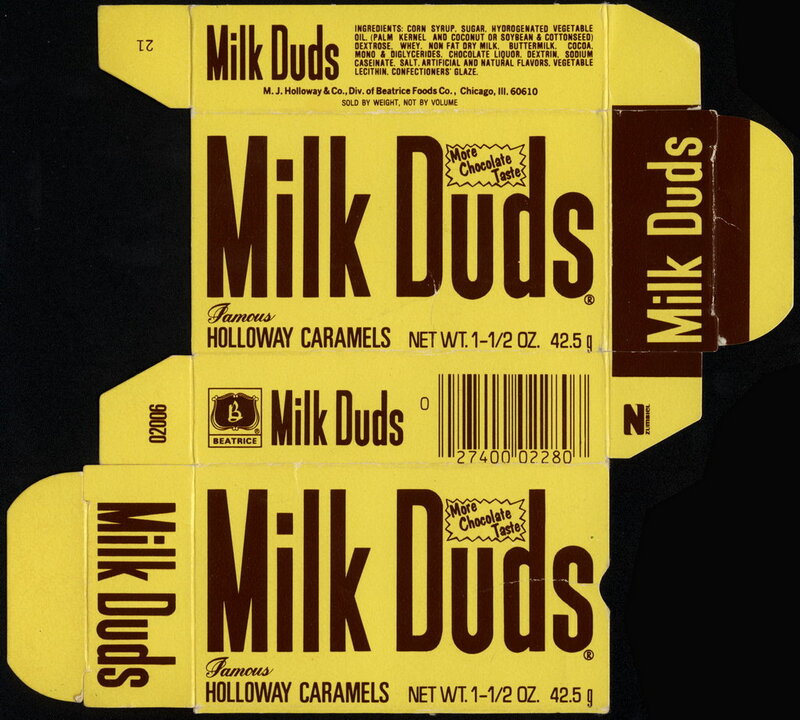 The Hershey’s era starts out proudly stating “Milk Chocolate Covered Caramels” on the box, with actual milk chocolate listed in the ingredients. 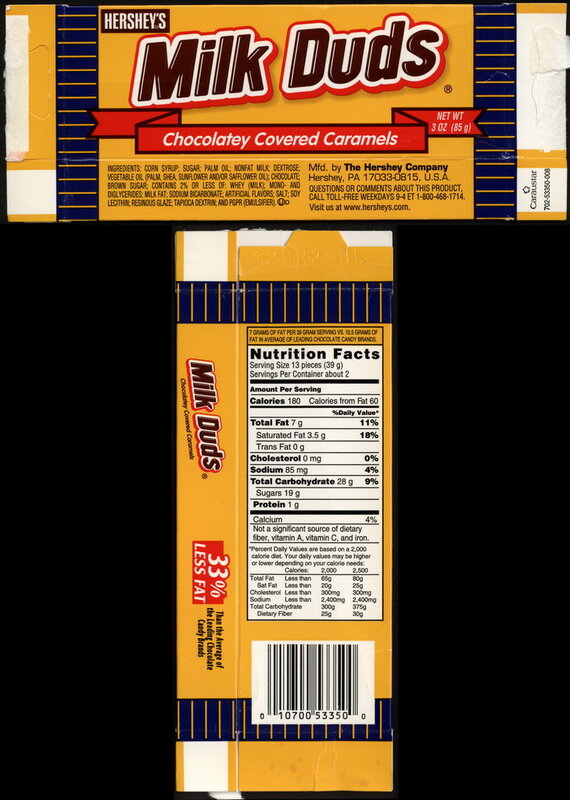 Then we transition to “MADE WITH Chocolate & Caramel,” and milk chocolate mysteriously disappears from the ingredients. What do we see added instead? Vegetable oil, ugh!! Well, it’s not quite that simple. 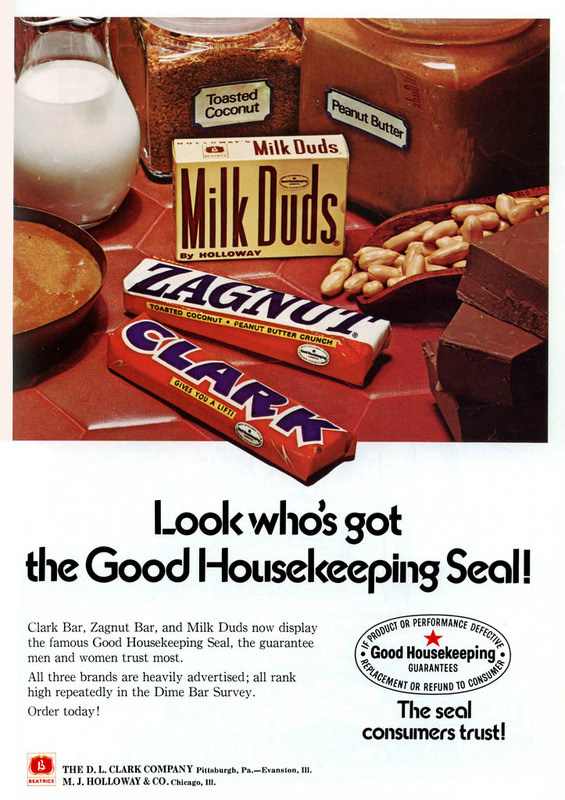 Back in the 1970’s, they were only using “chocolate-flavored” coating. 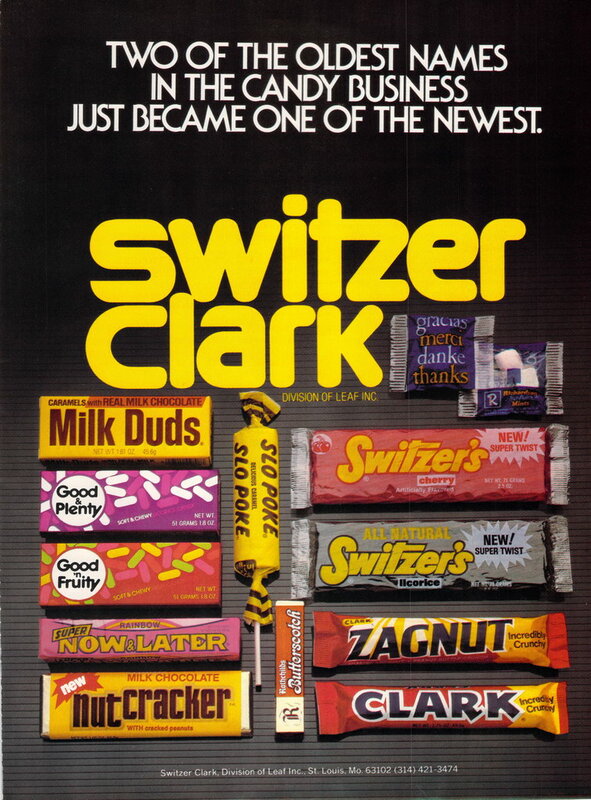 It’s Clark in the early 1980’s who starts using real milk chocolate again. 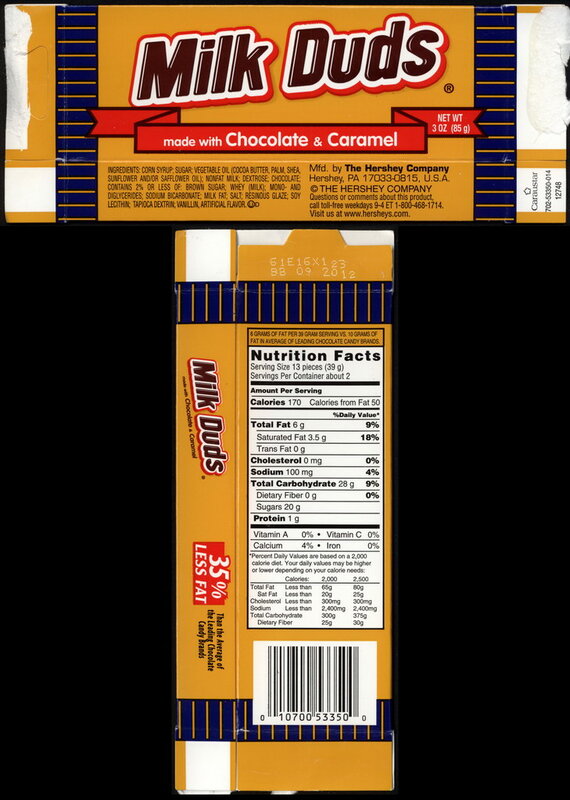 Hershey continues that, then backs down with Chocolatey (code for not real chocolate) but then brings back actual chocolate in 2012 (at least in the theater packages). Though Chocolate is better then Chocolatey, it’s not the same as Milk Chocolate. 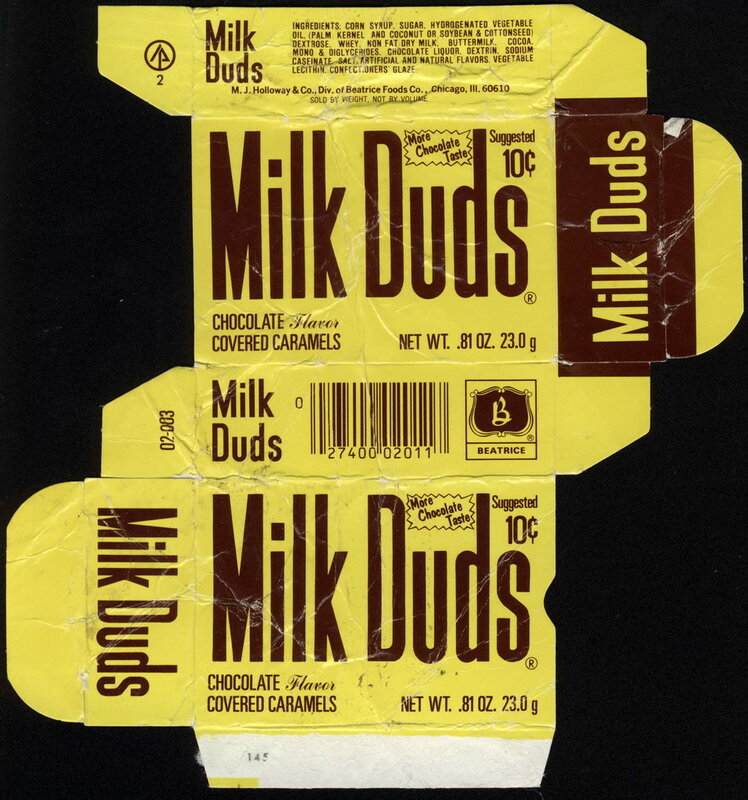 Milk Duds were chocolate-covered in the 1930’s, they weren’t in the 1970’s, but then were MILK chocolate covered in the 1990’s , then weren’t, now are chocolate-covered again. 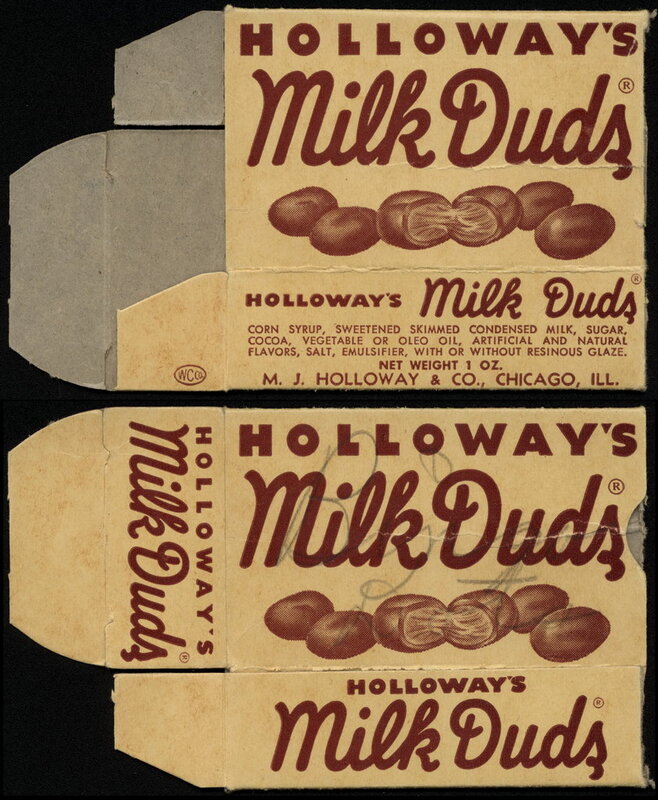 I would also point out that, in the 1930’s, the very first ingredient was corn syrup. 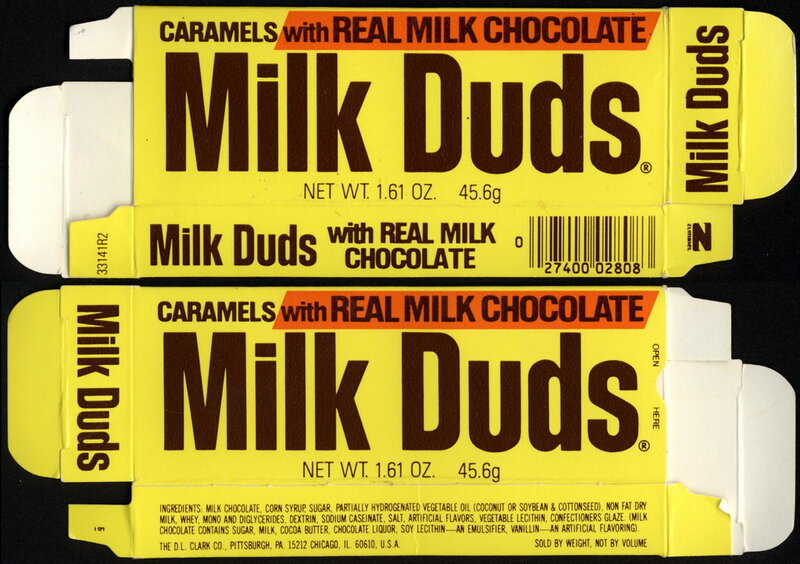 Milk Duds have always been my go-to movie candy, too. Well also Dots, when I’m not in a chocolatey mood. 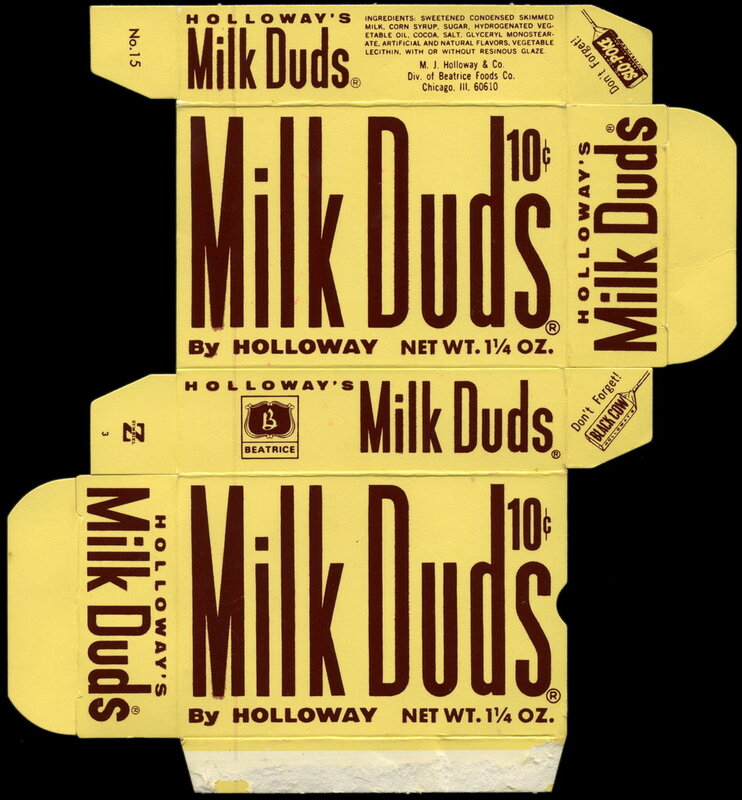 I wish Milk Duds had had a mascot at some point in the history, but I also appreciate the relative consistency in their brand’s look over the decades. Nice post. 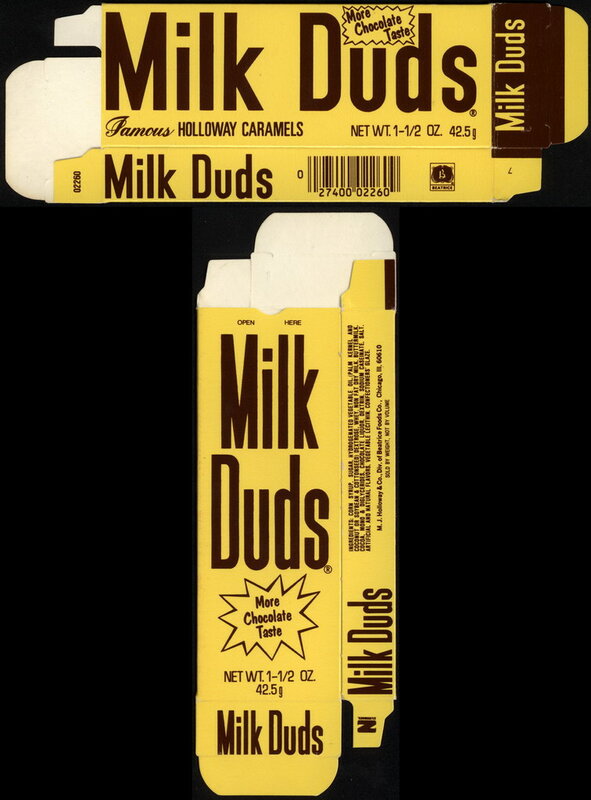 Milk Duds, when I was a kid in the 60s, had a thick coating of milk chocolate, not the thin “Spray painted” layer they have now. 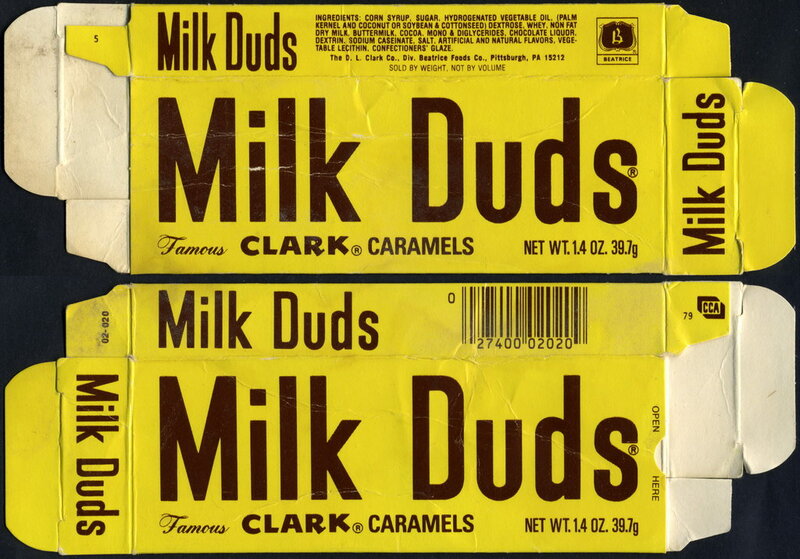 The milk chocolate was so thick that the box had a layer of wax paper inside. 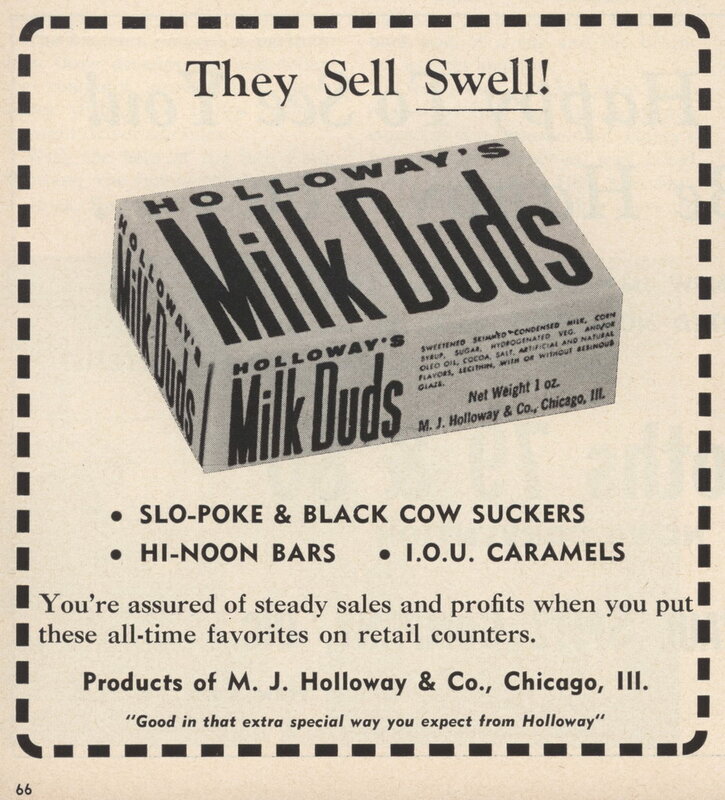 My father was a box sales representative operating out of Chicago in the 1950s, in order to gain a new account considered one of his favorite candies yeah realize the cursive script did not adequately represent the unique qualities of Milk Duds. As he told the story, he went to his art department and asked for a bold new design With the block letter Font. He then took that design to the makers of milk dud‘s, based out of Chicago, a local account, setup up a cop-call meeting and sold them on the new artistic packaging, representing the bold structure and flavor of milk dud’s, and won the account. 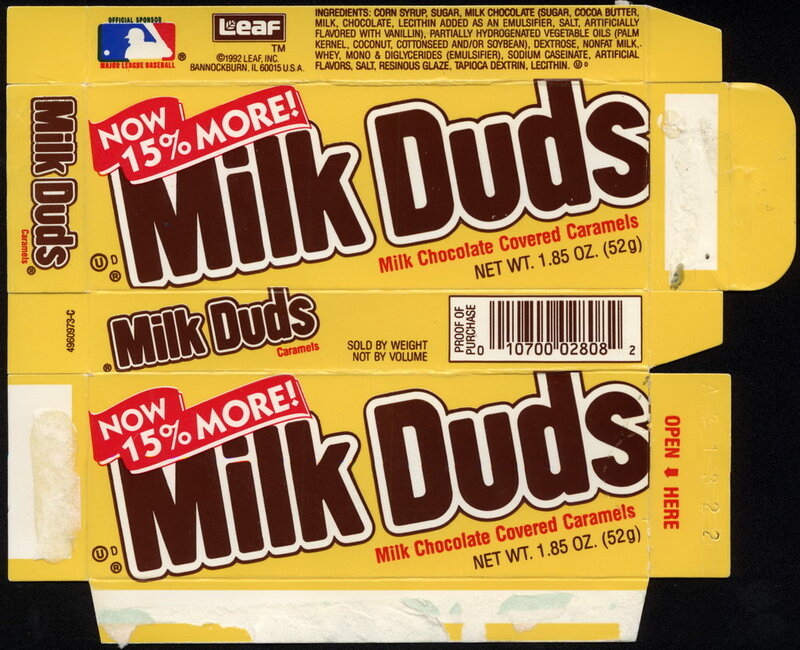 Along with the new design was a surge in sales of milk duds, and my father landing a very successful account, insuring the continuing availability of his favorite candy for the movies. Based on that successful sale, he was granted a transfer to Southern California, where I was raised, and continued to have tremendous success in the cardboard industry. PS He also was involved in the design and sale of the foil coated Kleenex tissue box of the 1960s. He realized the potential for artistic display to be found in an unexpected location, a playful colorful reflective piece of art, in contrast to the industrial standard Facial tissue box, an ubiquitous feature of the bathroons of the 1960s. Thank you for collecting these packages and sharing them with the world, and bringing back these wonderful family stories.